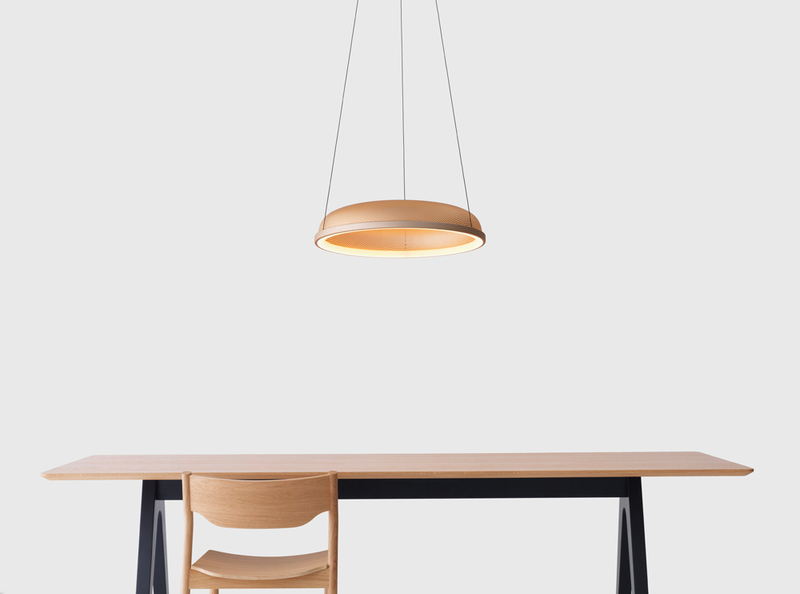 The Mesh Space pendant is constructed around a seamless floating halo of LED light. It hangs horizontally with a very thin profile and creates a warm, functional light effect on surfaces below. A flattened mesh dome is a reflector and a filter to the upward moving light. The LED light ring is powered through the thin suspension wires to achieve a real lightness and transparency to this piece. Like the Mesh Space pendant, the matching wall/ ceiling light is constructed around a seamless ring of LED light. Here it floats vertically to create a warm and functional light loop. The flattened mesh dome reflects light into the space and filters the light onto the wall. The LED driver is contained within the base.